Look up! The stars overhead change as the seasons change on Earth. The stars highest above the horizon in mid evening are considered to be the stars of the season. A sure sign of autumn is the Great Square of Pegasus. At the end of October to the first Sunday of November see the four stars that mark the Great Square east of overhead around 7:00pm Daylight Time. After we set our clocks back an hour and during the first two weeks of December view this Great Square overhead around 7:00pm Standard Time. This configuration of stars is often mistaken for the Big Dipper in Ursa Major, a northern circumpolar constellation. Ursa Major can be seen overhead all year round as it circles the north pole. The Great Square of Pegasus is seen overhead only in autumn. Note: During the beginning of the fall season, when the nights are getting shorter – at the end of September and mid October during Daylight Saving Time – this Great Square is seen high overhead around the midnight hour. The "bowl" of this Autumn Dipper is the Great Square of Pegasus. The ancient Babylonians called this square "The Doorway to Paradise." Today astronomers travel through this doorway or "window" to the edge of our Milky Way Galaxy and go beyond to other galaxies! This imperfectly shaped square is not a constellation; it is an asterism. 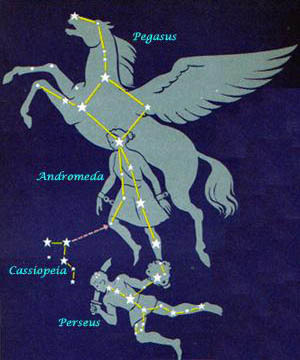 Three of its corner stars, Markab, Scheat and Algenib, belong to the constellation Pegasus, the Flying or Winged Horse, and the fourth corner star is Alpheratz, the brightest star of Andromeda, the Princess. Review map above. The "handle" of the Autumn Dipper stretches to the northeast and three of its almost evenly spaced stars, Alpheratz, Mirach and Almach belong to Andromeda. The fourth star, Marfak (Mirfak), is the brightest star of the constellation Perseus. Review map above. BTW: Markab, Alpheratz, and Enif, the nose star of the mythical winged horse, are bright navigation stars. Shown about 8:00 PM the first week of November for mid-Northern latitudes. Located between the Great Square Pegasus, and the smaller constellation of Cassiopeia (the red "M" or "W" pattern above) is the Andromeda Galaxy (gray swirl) where billions of stars reside. At a distance of 2.5 million light years from Earth, the Andromeda Galaxy, also known as M31, is the farthest object visible to the unaided eye (a moonless night away from city lights helps). Note: As seen in the map above, the Great Square is the body of Pegasus and a large red dot has been used to mark the nose of Pegasus, a star called Enif. Star Gazer points out that viewing Andromeda means we are looking back in time. We see it not as it exists now, but as it existed 2.5 million years ago, just about when the Australopithecus walked on this earth (2.9 to possibly 9.7 million years ago)! A friend of mine says, "The past, present and future are all occurring now!" I don't know about you, but I am going to travel the night sky to the Andromeda Galaxy. This will be a future experience for me, looking for the light of the prehistoric past, and I'll be as present in the moment as I can with it. I invite you to join in on this night sky time traveling adventure. 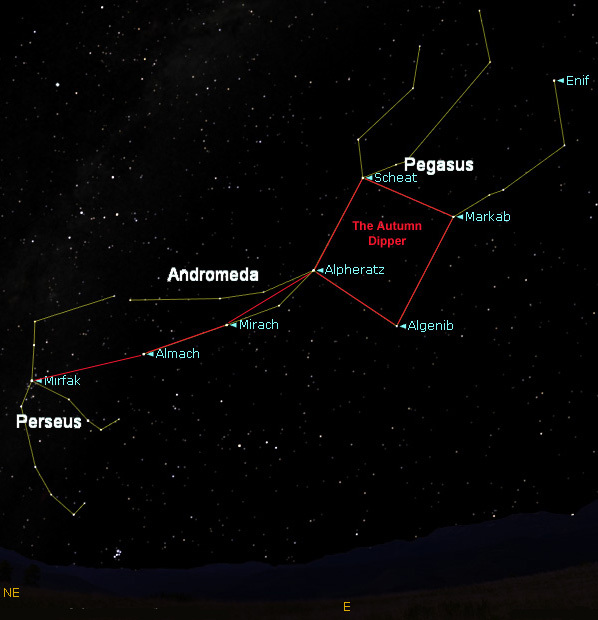 Deneb and Altair, two stars on the eastern side of Summer Triangle, map the way to Enif, the brightest star of Pegasus. Just travel southeast of Deneb and east of Altair to find the glowing nose star of Pegasus. Review this map. Now try locating Fomalhaut (not shown in the above image); it boldly shines southeast of Enif and south of the Great Square's two stars Scheat and Markab, above the southern horizon. Map Often called the Lonely One, Fomalhaut of Pisces Austrinus, is a solitary bright star in a dark celestial sea of faint "watery" constellations. 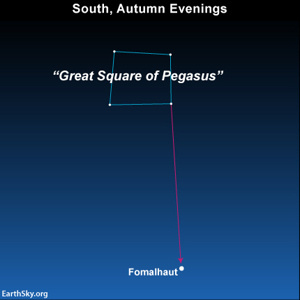 Fomalhaut can be seen due south in the ocean of stars October 15, 10pm; November 15, 7pm; December 15, 5pm.